This page features full coverage of the latest science from ACC.19 – including trial summaries, news stories, journal scans, slides, videos and more. The goal of the SMART-CHOICE trial was to compare the safety and efficacy of short-duration dual antiplatelet therapy (DAPT) (3 months) compared with longer-duration DAPT (12 months) among patients undergoing percutaneous coronary intervention (PCI). Get the perspective and context you need for the most impactful research released during ACC.19 with this latest installment of ACC Cardiology Hour. Drs. Kim Eagle, Salim Virani, and Roger Blumenthal discuss the new ACC/AHA primary prevention guideline. Dr. Peter Block interviews presenter Dr. Michael Reardon regarding self-expanding TAVR or SAVR in patients at low risk of surgical mortality (Evolut Low Risk). Dr. Peter Block interviews presenter Dr. Sanjiv Jayendra Shah regarding PANACHE: Neladenoson Bialanate in HFpEF. Dr. Peter Block interviews presenter Dr. Renato Lopes regarding AUGUSTUS:, apixaban vs. vitamin K antagonist and aspirin vs. placebo in AFib and ACS, PCI. 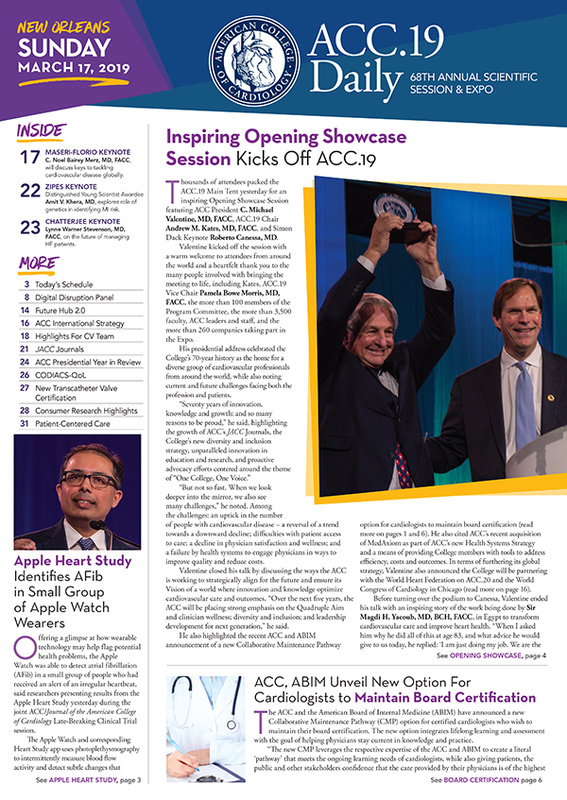 The ACC and World Heart Federation (WHF) will jointly host ACC's 69th Annual Scientific Session with WHF's World Congress of Cardiology (ACC.20/WCC), taking place March 28 – 30, 2020 in Chicago, IL. In patients with acute aortic dissection, in-hospital mortality for Type A and Type B dissection has decreased over time, with an increase in five-year survival, according to results of the IRAD study presented March 18 at ACC.19 in New Orleans, LA. For patients with atrial fibrillation (AFib) who consumed moderate amounts of alcohol, abstinence from alcohol reduced AFib burden and rates of recurrence, along with improving symptom severity and blood pressure control and weight loss. Is dietary consumption or egg consumption associated with cardiovascular disease (CVD) and all-cause mortality? Dr. Peter Block interviews presenter Dr. Deepak Bhatt regarding REDUCE-IT: Reduction in Total Ischemic Events With Icosapent Ethyl. Dr. Peter Block interviews presenter Dr. Eri Toda Kato regarding dapagliflozin on HF and mortality in diabetes based on EF (DECLARE TIMI-58). Dr. Peter Block interviews presenter Dr. Anne Goldberg on CLEAR Wisdom, bempedoic acid added to maximally tolerated statins in hypercholesterolemia. 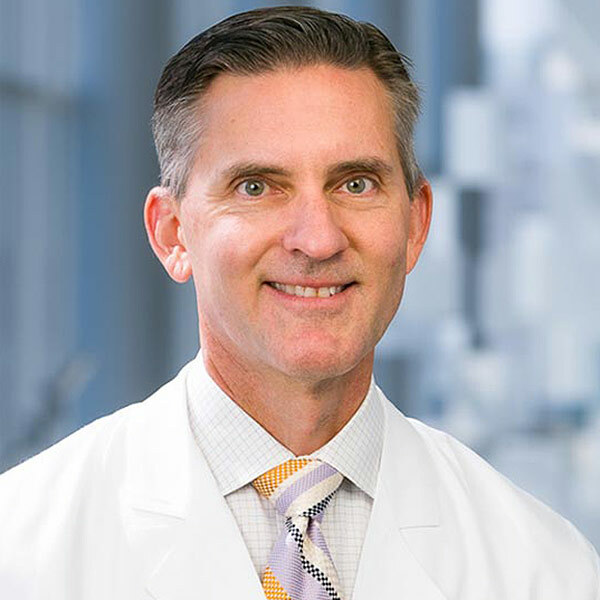 Today, Richard J. Kovacs, MD, FACC, will become ACC's newest president – leading the College as it celebrates its 70th Anniversary and embarks on the first year of its new Strategic Plan. The release of the CANTOS clinical trial in 2018 provided long-awaited proof-of-principle that lowering inflammation without lowering cholesterol can substantially reduce rates of myocardial infarction, stroke and cardiovascular death. The goal of the HPS3/TIMI55-REVEAL trial was to evaluate the cholesteryl ester transfer protein (CTEP) inhibitor anacetrapib compared with placebo among patients with stable atherosclerosis. The goal of the Alcohol-AF trial was to evaluate abstinence from alcohol compared with usual consumption among patients with atrial fibrillation and moderate alcohol consumption. The goal of the CREOLE trial was to compare the safety and efficacy of three different antihypertensive combination medications among sub-Saharan patients. The goal of the SAFARI-STEMI trial was to evaluate radial access compared with femoral access among patients undergoing primary percutaneous coronary intervention (PCI) for ST-segment elevation myocardial infarction (STEMI). The goal of the INFINITY trial was to evaluate intensive ambulatory blood pressure (BP) lowering compared with standard ambulatory BP lowering among elderly patients with hypertension. The goal of the CLEAR Wisdom trial was to compare the safety and efficacy of bempedoic acid compared with placebo among patients already on intensive or maximum-tolerated statin therapy. The goal of the DECLARE–TIMI 58 trial was to assess the cardiovascular (CV) safety of dapagliflozin in patients with type 2 diabetes mellitus (DM2) and either established CV disease (CVD) or multiple risk factors. The goal of the REDUCE-IT trial was to assess the safety and benefit of icosapent ethyl compared with placebo in reducing cardiovascular (CV) events among patients with high triglycerides (TGs). The goal of the ODYSSEY OUTCOMES trial was to compare the safety and efficacy of alirocumab compared with placebo among patients with recent acute coronary syndrome (ACS) already on intensive or maximum-tolerated statin therapy. The goal of the TREAT trial was to evaluate ticagrelor compared with clopidogrel among patients who received fibrinolytic therapy for ST-segment elevation myocardial infarction (STEMI). The goal of the STOPDAPT-2 trial was to evaluate 1-month dual antiplatelet therapy (DAPT) compared with 12-month DAPT among patients undergoing percutaneous coronary intervention (PCI). 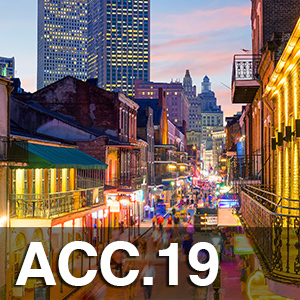 Compared with other bleeding avoidance strategies (BAS), transradial access (RAD) is the most effective for PCI-related bleeding according to poster research presented March 16 at ACC.19 in New Orleans, LA. The following are key perspectives from the 2019 American College of Cardiology/American Heart Association (ACC/AHA) Guideline on the Primary Prevention of Cardiovascular Disease (CVD). Dr. Peter Block interviews presenter Dr. Martin Leon regarding PARTNER 3: TAVR or SAVR in Low-Risk Patients. The goal of the Evolut Low Risk trial was to assess the safety and efficacy of transcatheter aortic valve replacement (TAVR) compared with surgical aortic valve replacement (SAVR) in low-risk patients. The goal of the PARTNER 3 trial was to evaluate transcatheter aortic valve replacement (TAVR) compared with surgical aortic valve replacement (SAVR) among low-risk patients with symptomatic severe aortic stenosis. The goal of the COAPT trial was to assess the safety and efficacy of transcatheter mitral leaflet approximation using MitraClip among symptomatic heart failure (HF) patients with secondary mitral regurgitation (MR). The goal of the RADIANCE-HTN SOLO trial was to assess the safety and efficacy of renal denervation compared with sham control among patients with mild to moderate systolic and diastolic hypertension. Thousands of attendees packed the ACC.19 Main Tent yesterday for an inspiring Opening Showcase Session featuring ACC President C. Michael Valentine, MD, FACC, ACC.19 Chair Andrew M. Kates, MD, FACC, and Simon Dack Keynote Roberto Canessa, MD. ACC's family of JACC Journals continues to grow and innovate – setting the bar for what it means to be global cardiovascular journals. "This is a 'world is flat' moment in medicine," says Harlan M. Krumholz, MD, SM, FACC, acknowledging that the access to data through digital health is a game changer. 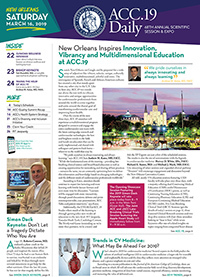 While ACC's mission – to transform cardiovascular care and improve heart health – may have begun domestically, the roots of the College and its mission now sprawl across the globe. Medical science has made great progress in treating cardiovascular disease, but an even more effective approach would be to take steps to stop the development of disease. Drs. 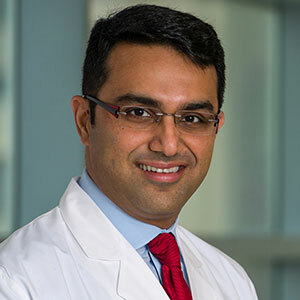 Deepak Bhatt and Peter Block discuss AFib detection using the Apple Watch (Apple Heart - 00:30); NT-proBNP inhibition after acute decompensated HF (PIONEER-HF - 02:35); depression in HF and ACS (Hopeful Heart and CODIACS-QoL - 03:52). The goal of the trial was to assess the safety and efficacy of using sacubitril/valsartan among patients hospitalized with acute decompensated HF (ADHF). The goal of the CODIACS-QOL trial was to evaluate depression screening compared with no screening among patients with recent acute coronary syndrome. The goal of the trial was to evaluate collaborative care for co-morbid heart failure and depression compared with usual care among patients recently hospitalized for heart failure. Watch video coverage of the hottest ACC.19 trials.